Willie Howard Mays, Jr. or “The Say Hey Kid” is best remembered as the revolutionary player from the African-American Leagues to take MLB by storm. A Hall of Fame inductee, Mays shares the record for most appearances for the All-Stars with Stan Musial at 24. Many believe that Mays was the best center fielder of all-time. He holds the joint-record for twelve Golden Gloves, but the surprising part is that the honor was introduced six years after his debut season! With 660 home runs, he is currently the fourth highest scoring ballplayer in history. Renowned for his time with the San Francisco Giants, Mays faced many hardships before making it into the big league. The New York Giants signed Mays from his home team – the Birmingham Black Barons in 1950, and sent him out on loan to their feeder club in Iowa. However, the racist manager in charge of the club refused to use him because of the color of his skin, forcing Mays out of the team, and onto the Minneapolis Millers’ roster. He was the only player of African-American descent in his team, and was often subject to racial slurs and death threats. But his strong character and amicable personality did not let his nerves affect his game, as he produced moments of magic from time to time. Following eye-catching performances, Mays was recalled to the Giants when he was twenty years old – a move that set the wheels in motion on a truly outstanding career. His first season with the Giants ended with Mays bagging the Rookie of the Year award, and the pennant with his team. A two-year absence from the game due to drafting in the army did not hinder Mays’ progress as a ballplayer. He returned so much stronger, that he was the sole dominant force of the game at the time. Mays finished four seasons as the top hitter in MLB and won the MVP award on two occasions. The moment in his career that is still played over and over again, is his mind-boggling catch in the World Series of 1954. The full-speed run toward the boundary and a last-moment glance, to pull the ball through mid-air with an incredible over-the-shoulder catch is regarded by many, as the best catch in baseball history. But Mays maintains that he had made several other catches far more impressive than that. The Best Player Ever? Mays-be! 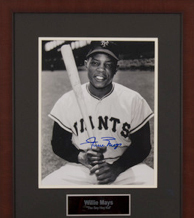 The career statistics of Willie Mays make him an unquestionable great, but the longevity of his career in an era where PED was not of the essence, make him something beyond legendary. Baseball experts believe that Mays is possibly the best all-round player MLB ever witnessed. 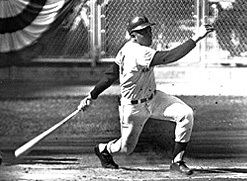 He featured in the MLB All-Century Team, and is one of the few players who spent eight consecutive seasons, with 100 RBIs. His 50-plus home runs during the 1955 season and the 1965 season represent the longest duration any player had taken to reach the milestone in MLB history. Even through torrid times, Mays’ spirit stood tall where many others’ would fall, making him an absolute icon for any aspiring ballplayer.